Our latest Critical Compilation sets sights on BioWare’s landmark Mass Effect trilogy, brought together by Emma Kostopolus. Emma is a Ph.D student of Rhetoric and Composition at the University of Kansas, where her work focuses on the intersections of rhetoric and videogames as well as gaming in the classroom. You can find her at Nerd Salad. The original Mass Effect trilogy stands out among BioWare’s RPG catalog for various reasons, not least of which is its continued ability to captivate the imaginations of its players, with some devoting incredible spans of time to the game. Game director Casey Hudson commented on this phenomenon in 2010, saying “we wanted to create an experience that was less about being a game and more about being an experience.” And while not everyone was entirely satisfied (like this guy), the trilogy still has a lot of staying power, including both being called “the most important science fiction universe of our generation” by Kyle Munkittrick and even being put forward as presenting a solution for a scientific paradox. In this compilation, we’ll dissect some of the larger issues that have pervaded the discourse since the first game’s release up to the present, focusing on the trilogy’s continuing influence in game design and its enduring fandom. If Mass Effect was a sci-fi shooter saddled with excess RPG micromanagement, Mass Effect 2 is the ideal evolution. If Mass Effect was an RPG that tips its hat to third-person action games, Mass Effect 2 may be less satisfying than expected. Isaac Handelman expands on this, stating that ME2 felt like a more “confined experience,” but the “focused scope of the sequel” led to “vast improvements.” Hollander Cooper echoes this, calling ME2 “The Empire Strikes Back” of the series. Michael Abbott walks back some of the praise for the choice, saying “when we discuss Mass Effect 2 as the game to finally shatter RPG genre limits and chart a new narrative path, I think we project too much on a genre that exchanges some limits for others.” In an interview, lead producer Adrien Cho even calls the streamlining of mechanics from the first game an issue of “accessibility,” which can be interpreted in several different ways. The gameplay changes aren’t the only reason why Mass Effect 2 received attention from writers; people were also very interested in the way that they felt ME2 expanded on and developed the relationships that Shepard has with their squadmates and the crew of the Normandy. These “loyalty missions” range in scope and scale, but in his discussion what he feels is the best loyalty mission in the game, Chris Breault argues that the game’s “greatest moments – and it’s a good game—come when it revisits older RPG traditions, sets limits on the player’s influence, and suggests more than it shows,” indicating that while some of the generic conventions of the franchise have shifted, they are not entirely gone. I care about saving the people I like, so if I don’t like someone and purposely skip their loyalty mission, when they die it won’t be depressing or dramatic, it’ll just be the death of a minor character that I was never very interested in to begin with. A death is only emotional if I care about who dies, so the loyal squad mates should always be the first to go in order to heighten dramatic tension. Dinicola argues that, for a better experience (especially on subsequent playthroughs), the suicide mission would be better if characters lived or died based on “player skill,” though he doesn’t go into specifically what that would look like. A perspective like this, while not directly responded to in any of the other sources listed here, throws into sharp relief a larger debate surrounding role-playing games like Mass Effect — about how much mastery a player has achieved over the gameplay should effect the story and whether “gitting gud” should necessarily lead to better outcomes. Games are a soup of tiny decisions, every moment we choose to pull a trigger or jump or swim or steal a car or swing a sword, and it’s all done without much thought. However, when the game goes beyond the automatic and asks you, honestly, what you would do, that’s when I can feel the full brunt of what it means to be that character. LB Jeffries agrees with this assessment, saying that “the key to Mass Effect’s success is by instilling the player with a real sense that their choices in the game matter,” It is these decisions that “go beyond the automatic” that endear the player to their Shepard and lead them to place an emotional stake in the universe of the game. When specific historical moments get folded into fictional constructs (with a certain amount of talent), they can become universal. Toward the end of Mass Effect 3, the player can choose to spend a moment with fan favorite squadmate Garrus Vakarian, in which the two reminisce and agree that “There’s no Shepard without Vakarian.” This line spawned copious amounts of fan art and merchandise, but it also points to a larger truth about the series as a whole. There may not be a Shepard without Vakarian (and Rowan Kaiser makes a pretty good point about how great he is), but you can also argue there’s no Mass Effect without Shepard. The attachment players can feel to “their Shepard,” developed through character customization of appearance and gender, decisions of Paragon or Renegade moral action, and role-playing through different sexual identities, is a strong one, as evidenced by this really cool character piece by Kate Simpson. The ways in which players relate to and experience the game through the lens of a Shepard of their own making deeply impacts their memories of play and the way that they conceptualize the universe. Doenau sees in the Mass Effect trilogy “an expression of democracy,” but he ties it directly to the ways in which the player can “create an individual Shepard – a Shepard they can call their own.” The player experiences the world as Shepard, who can be a morally upright Paragon or loose-cannon Renegade or somewhere in between, depending upon how the player chooses to characterize them. 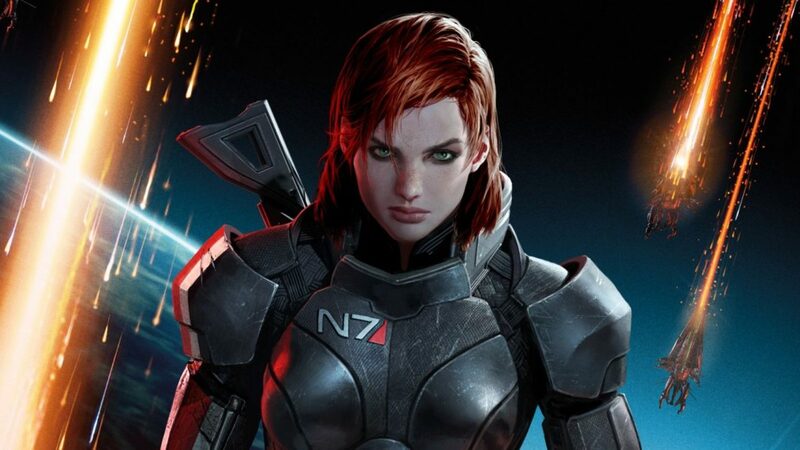 According to Ben Chapman, his decision to play female Shepard (FemShep) as a villain has deeply affected the ways in which he interprets things like the tone and timbre of Jennifer Hale’s voice acting. Chapman’s run as Shepard also serves to neatly segue us into our next topic of discussion, which is how the game deals with sexuality. He observes (as many have) that choosing to play as a female Shepard, whether Paragon or Renegade, largely does not affect the ways in which NPCs engage with Shepard, outside of gender-locked romance situations. Chapman holds this up as a victory because, he argues, the game manages not to make gender “an intrusive character trait.” This naturally leads to the question, then, of whether or not it should be. Alisha Karabinus, while not responding directly to Chapman, tries to tackle this by asking “where might we be if Shepard had just been a woman?” Karabinus is (rightly) interested in the ways in which the universe of Mass Effect might have been different if the game had been designed specifically for a female player-character, instead of a world that has openings for either gender but still assumes male as the default. Mass Effect is well known for its variety of romanceable NPC options, including several different races of aliens. Throughout the series, Shepard can engage in any number of encounters, ranging from casual affairs to serious romantic relationships spanning the entire trilogy. These choices allow players to create a sexual identity for their Shepard that they role-play throughout their time in the universe. As Krobova et. al puts it, “the player character is never clearly defined as either hetero- or homosexual – he or she can only make straight or queer choices,” which gives a considerable amount of freedom to players. Tali: veiled perfection, calibrated voice due to the air purifiers, a humanoid form but not entirely Human, she my escape from the world I know too well but instead she becomes a return, a future point of reference referencing the all too present past, the pain that is knowing the world has turned into a universe yet still the forms of the Old/New World govern, 1492 indistinguishable from a 2183, Columbus setting sail into the galaxy with his ordering and classifying and systematizing of human hierarchy in tow, the modeling of her pixelated body, her 2-D body, following a familiar schema, an exhausted code. The truly queer – that is subversive/resistant – potential of Mass Effect lies in its (ludic and narrative) representation of non-hegemonic male characters, which engages multiple and intersecting discourse of non-normative identity construction of which sexuality is but one. While there are eventually available gay male romances in the game, the way the series deals with issues of masculinity as intersecting with sexuality are topics worth exploring in greater depth. We’ve avoided it for as long as we could, but the hour of reckoning is at hand. The ending of Mass Effect 3 caused an uproar of nigh-Biblical proportions that led to an alteration of the way fans fundamentally view their relationship with games as cultural artifacts, since after an entire movement sprung up around getting BioWare to alter the ending, a patch was released that gave more context to the final sequence. It was a move that Keith Stuart called fans “taking ownership of the brand.” But some fans were still unsatisfied, including one who wrote a four hundred page fanfiction to address the ending’s shortcomings. BioWare’s failure, then, isn’t in terms of its story-writing, or its pacing, or that Shepard dies (indeed, my Shepard clearly did not die). It lies in changing the way the game’s most important decisions – the very things that gamers were so invested in – are made at the eleventh hour, with no indication or feedback to let players know this is going on. Some fans were so distraught about the way the ending went that they claimed that the entire series was now ruined for them (and Jamie Madigan has a sort of gross theory about why this happened). But for all the hate (and there was a lot of it to sift through) there were also people who appreciated what the ending was trying to do, and who defended it. Arthur Gies goes directly against a lot of criticism and claims that the game was successful in delivering its promise of meaningful player choice. Gies argues that the game is ultimately about death, which resonates with Kate Cox’s interpretation of the narrative, citing it as an “epic” with a “self-sacrificial main character prepared to martyr themselves for the greater good.” Rowan Kaiser moves beyond this framework and claims that Mass Effect 3 deserves to be remembered for more than its ending, talking about the successes of the game’s level design. At the end of the day, however, the ending remains incredibly divisive, with no clear consensus (even with the benefit of years to calm down and reflect). Depending on whom you ask, Mass Effect 3‘s conclusion was either a triumph of galactic storytelling or a failure to live up to the thematic promise laid out over three sprawling games. This Critical Compilation is, ultimately, far from exhaustive. Throughout the release cycles of all of the games in the series and for years afterward, Mass Effect has held the attention of the gaming community. Some return to it as they play other games and compare their narrative and ludic properties, as Krysten Majewski does with Mass Effect and the game Suikoden. Others continue to try and make sense of the ending and come to terms with the final moments given to us by the DLC, as with Jordan Rivas’s not one but two pieces about the Citadel DLC, which discuss the need for human connection and bring up a pretty cool fan theory about when the DLC actually takes place. Some even consider the real-world implications of the narrative, like this piece that examines the viability of a real-life genophage (yikes). Even years later following the release of Mass Effect 3, there is no lack of things to say about the trilogy. I personally look forward to the way discussion of this pivotal series continues to evolve as we advance the craft of games and how we talk about them. Do you have an article you feel belongs in this compilation? Drop us a line!